For nearly three hundred years the East India Company dominated British trade and relations with Asia. It made handsome profits for shareholders but also provided collectors in Europe with natural specimens and man-made rarities that were prized for their scientific, aesthetic or cultural value. An array of administrators, soldiers, surveyors spent much of their lives attempting to inventory and to comprehend India’s vast country, its teeming populations and its myriad rituals and wildlife. 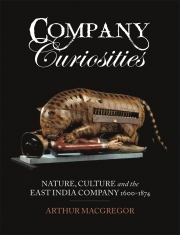 Company Curiosities: Nature, Culture and the East India Company, 1600–1874 offers the first-ever overview of the remarkable role of the East India Company and its servants in collecting and showcasing a treasure-house of natural specimens and man-made objects – craft materials, paintings and sculptures, weapons, costumes, jewels and ornaments – that established the look and the feel of India for those who had never ventured abroad. Arthur MacGregor tells the stories behind the remarkable discoveries and collections, and those responsible for them, and their impact on natural science, commerce and industry, and personal taste. Arthur MacGregor is a former archaeologist and was Senior Curator at the Ashmolean Museum, Oxford. 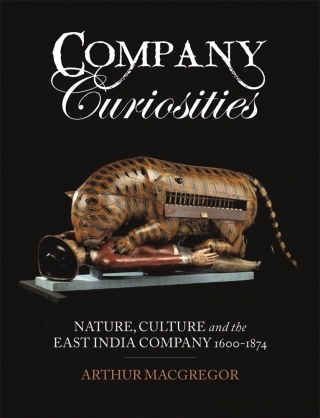 He is a founding editor of the Journal of the History of Collections and the author of Bone, Antler, Ivory and Horn (1985), Curiosity and Enlightenment: Collectors and Collections from the Sixteenth to the Nineteenth Century (2007) and Animal Encounters (Reaktion, 2012).